Our world is now evolving around technology and every day we are getting more and more products that can be synced with our smartphones and mobile devices to make our life easier, for example, smart locks. The technology has now got to locks and doors, offering the ability to control our doors without a key, just a touch of a button. The idea of smart locks is available through different manufacturers and can be used as a selling aspect during your home building contract. Now let's take a look at how these smart locks function and if they are the best option for you. Not all technology is the same, so you can opt to use different alternatives depending on the customer needs and the cost of the lock that your customer wants to have. Some smart locks can offer the ability for you to just place a smart control over the existing deadbolt while others will require you to replace the whole lock system. The amazing features that these locks offer vary widely and can be combined with the security systems making it ideal for smart homes but watch out not, everything is good, there are some factors that you will need to pay attention too. Yale Real Living - Although it is not fully compatible with a smartphone on its own, it can be combined with home automation systems so it can be controlled through your smartphone. The system is a full hardware replacement, touchscreen keypad lock that offers a mechanical cylinder with key-less lock options. Haven - This is kind of a different lock, as it needs to have installed a base in front of your door. The lock or base provides a mechanical barrier to entry that is released via Bluetooth or Wi-Fi. The system is compatible with smart thermostat systems and can detect forced entry, however, it can only stop inward-opening doors, so if your door opens out, then the system is useless. August - Offering an aluminum circular lock that replaces your existing deadbolt, this smart lock can be controlled using a smartphone. The lock will let you know when people are using the lock and it can be used to send digital copies of your key to friends and family. The system uses Bluetooth technology and it will unlock automatically when you are getting closer to the door. Kwikset Kevo - This smart lock is a bit more secure as it will need your finger to tap the lock so it can work, but only if the phone or key fob is nearby. Digital keys can also be shared with other people and those controls can be managed from the Kevo app. This will​ require you to replace the existing deadbolt and can be combined with your WiFi network so you can remotely control the lock on the door and get updated on who is entering through your door. Kevo is available on Apple iOS and select Android 5.0, Lollipop devices. 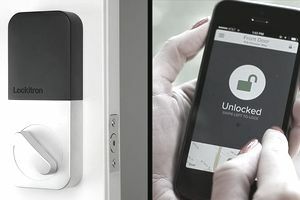 Lockitron - This is one of the more economical smart locks available in the market. It works by installing a smart lock over the deadbolt on your door, and it can work with any smartphone through their App. The lock will open with a tap and can be used to provide access to family and friends through their app. It can be opened with your smartphone in front of the lock, remotely via a web app, or even with a text message.